Walter Matoni was born on 27 June 1917 at Duisburg. Matoni was posted to JG 27 in summer 1940. Feldwebel Matoni was assigned to 9./JG 27. He accumulated four victories with this unit, including his first, a RAF Hurricane fighter on 30 September, during the Battle of Britain. During July 1941, Matoni, operating over Russia, claimed three further victories to raise his victory total to four. On 17 August 1941, Feldwebel Matoni joined JG 26 based on the Channel front. He was assigned to 5./JG 26 but was soon transferred to 7./JG 2 on 21 September. The reason for his transfer is not known. He was badly wounded in aerial combat resulting in a lengthy convalescence. Matoni was transferred to undertake a tour as an instructor with Jagdgruppe West as part of his recovery programme. He arrived on 20 October 1942 and served with the unit until 13 February 1943. 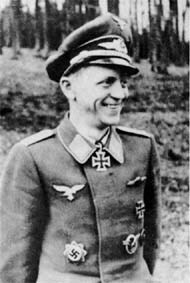 In February 1943, Leutnant Matoni arrived at JG 26 from his stint as an instructor. He was assigned to II./JG 26 based in France. He shot down a RAF Spitfire fighter on 17 June to record his fifth victory. On 31 August, Oberleutnant Matoni’s Fw 190 A-5 (W.Nr. 530 118) “Black 1” was hit and he was wounded by return fire from USAAF B-17 four-engine bombers he was attacking. He force-landed at Montdidier. He was back in action in December claiming a RAF Spitfire fighter shot down near Boulogne on the 21 December as his 8th victory. In an action against USAAF B-26 twin-engine bombers on 14 January 1944, Matoni shot down a RAF Spitfire fighter escorting the bombers. His victim was, in all likelihood, an American ace flying with the RAF, Sqn Ldr Franz Colloredo-Mansfeld (3 confirmed, 4 probable and 4 damaged victories) of 132 Sqn, RAF. On 24 February, Matoni shot down an unescorted USAAF B-24 four-engine bomber near Frankfurt for his 13th and JG 26’s 2000th victory. Matoni was appointed Staffelkapitän of 5./JG 26 on 25 February 1944.  On 10 May, Matoni was awarded the Deutsches Kreuz in Gold for 20 victories. Included in his total were 11 four-engine bombers, five of which were Herausschüsse. By June, Matoni had received promotion to Hauptmann. On 15 August 1944, Matoni was appointed Gruppenkommandeur of I./JG 11. He was then appointed Gruppenkommandeur of I./JG 2 on 24 September, replacing Hauptmann Erich Hohagen (56 victories, RK), who had suffered serious head injuries in a forced landing. On 5 December, Matoni was so seriously injured in a crash he was unable to undertake any further combat flying. However, he was appointed Gruppenkommandeur of II./JG 2 in January 1945, a position he held until 28 February, fulfilling the role in a non-flying capacity. Matoni was awarded the Ritterkreuz on 2 January 1945. He ended the war at the Fighter Pilot’s rest-home at Bad Wiessee. Matoni died on 26 June 1988. Walter Matoni was credited with 34 victories in over 400 missions. He recorded three victories over the Eastern front. Of his 31 victories recorded over the Western front, 14 were four-engine bombers.